Beautiful old River Red Gum trees (Eucalyptus camaldulensis) along the Moralana Scenic Drive near Merna Mora Station in the Flinders Ranges National Park, South Australia. Moralana Scenic drive is a 28km unsealed road connecting the Wilpena and Leigh Creek Roads, this is one of the best drives through the Flinders Ranges. This beautifully scenic drive takes you through some of the most stunning landscapes in and around Merna Mora Station, Arkaba Station, the southern wall of Wilpena Pound, Black Gap Lookout, Red Range and Elder Range, and is especially colourful during spring and late afternoon. Signposted drive entrances are 24km north of Hawker on the Wilpena Road, and 42km north of Hawker on the Leigh Creek Road. 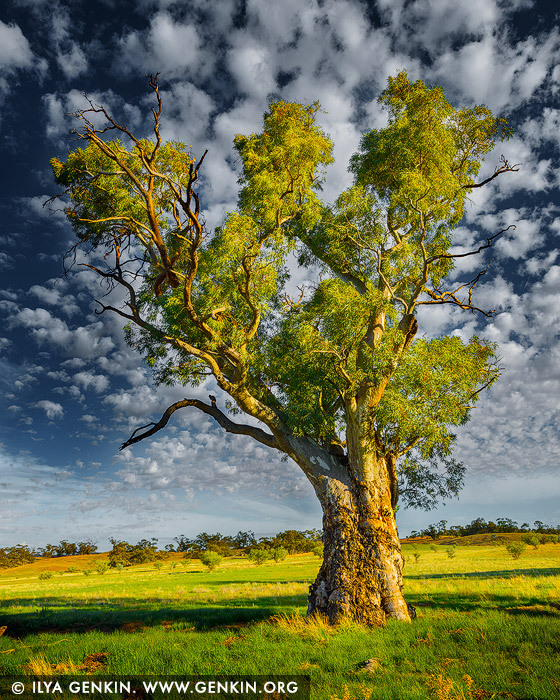 This image id AU-SA-FLINDERS-0020 of Old River Gum (Eucalyptus camaldulensis), is copyrighted © by Ilya Genkin. This is not a public domain image.